Call 973-547-7829 to schedule your first appointment. Miracle-Ear® is America's most recognized brand of hearing aids, and we have over 1300 locations nationwide. It's our goal to treat those who are dealing with hearing loss. Ignoring your hearing issues can lead to things like dementia, Alzheimer’s, anxiety, depression, and isolation, but we have a variety of comfortable hearing aids in Florham Park, NJ, to choose from that may help. Our team of experienced Hearing Care Specialists will help you find the best match for your needs whether that’s a discreet device that goes in the canal, in the ear, or behind the ear. With our new and exclusive GENIUS™ Technology, you’ll be able to recognize speech better, hear clear and rich sounds with less feedback and loud noises, control your device with our smartphone app*, and connect to your favorite electronics via Bluetooth®. You may not know that hearing aids can benefit nine out of ten people with hearing loss, and the professionals at Miracle-Ear aim to improve your hearing. Our location is independently owned and operated, and we’re proud to provide premium service to our customers from Florham Park, Chatham, Livingston, East Hanover, and Short Hills. We’d love to talk to you about our custom-designed products, industry-leading technology, and risk-free† trial. Contact our local hearing aid center when you’re ready to schedule an appointment. 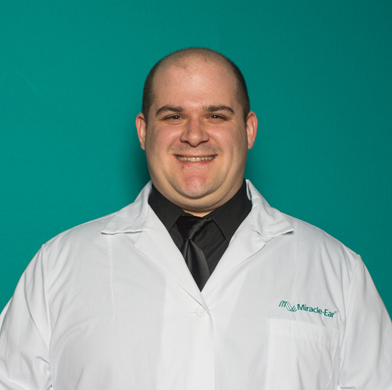 Christopher has worked with Miracle-Ear for two years as a Hearing Instrument Specialist. Christopher is a certified Hearing Instrument Specialist. Christopher's favorite part of working with Miracle-Ear is getting to help people every day. I had heard a lot about Miracle-Ear and I have friends that have it too so this led me to go with Miracle-Ear. I enjoy going there. Their sales, receptionist and customer service team were wonderful - very nice and professional. I went with the style that goes behind the ear but the little piece goes in my ear because that's the one I could afford. With this device, I can hear, and I don't have to keep saying, "Huh, huh what you saying?" My husband doesn't have to keep repeating, so it makes him happy.